Israel was one of the very First Nations to adopt the FN FAL rifle – after Canada but before many actual NATO nations. Israel made its first purchases of the rifles in 1955, and delayed them almost immediately in the 1956 Suez Crisis. The first rifles were wholly made by FN in Belgium, but over time IMI in Israel would produce almost all parts except receivers (they had a good working relationship with FN, which had licensed production of the Uzi submachine gun from IMI). These first rifles are good examples of many early FN design elements, which are not seen on later major NATO contracts, as the design details evolved over time. Israel would use the FAL through the Yom Kippur War in 1973 before transitioning to the 5.56mm Galil rifles. 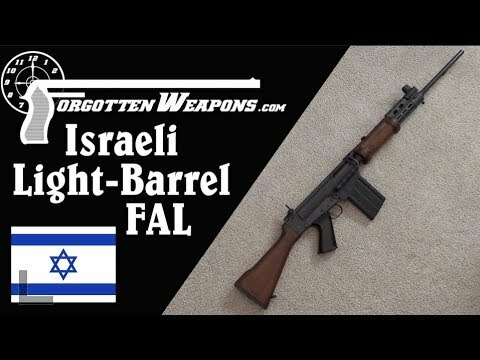 In addition to the light-barrel infantry rifle, Israel also adopted a heavy barreled version of the FAL as a light machine gun or automatic rifle. These were fitted with stout bipods, but used the same 20-round magazines as the standard rifles. A very small number of Israel semiauto FAL rifles were imported in the late 1980s, and they are very scarce in the United States today – or they were, until DS Arms acquired a supply of Israeli light-barrel parts kits and began assembling them into complete rifles to sell. They are particularly nice builds as the DSA markings and serial number are on the inside of the magazine well, allowing the external surface to be engraved with a very nice recreation of the original Israeli receiver markings with their distinctive Hebrew text and IDF insignia. Stay tuned for an upcoming 2-Gun Action Challenge Match on InRangeTV using this rifle!